Ondrej Lewit graduated at State Conservatory of Music (BA) Prague and at the Academy of Performing Arts-HAMU (MA) in Prague. He has served as concertmaster in many European Orchestras, and performed on stages throughout Europe. He has taught violin and chamber music at Santa Cruz Conservatory. In Southern California he has performed with California Consort and California Chamber Orchestra, Hutchins Consort, and Encore Trio. 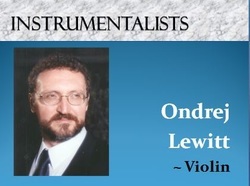 He is a current member of Quartetto Sorrento. Quartetto Sorrento performs music ranging from Haydn and Mozart to Shostakovich, Debussy and Thompson, including works by their cellist and composer, Gordon Grubbs. 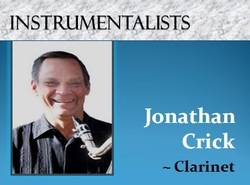 Jonathan Crick studied clarinet with Charles Freebern, Don Baird and Daniel Magnusson. He holds Bachelor's and Master’s degrees in music from SDSU and was given the Outstanding Music Major and Outstanding Orchestra Member awards in his senior year. Since 1965 he has performed with numerous ensembles in San Diego, and has performed solo works in Matsumoto and Kyoto, Japan, Galway, Ireland, and Borlange, Sweden. He has given private music lessons in San Diego and in Galway, Ireland, where he introduced the Suzuki Recorder Method in that country. ​ Jon also taught music for the Sweetwater and San Diego Unified school districts, and started the K-6 elementary instrumental music magnet program at Baker Elementary. Having retired from working for XETV as an engineer, Jon continues to perform with various ensembles in San Diego, including the San Diego Clarinet Quintet and the San Diego Clarinet Society Clarinet Choir. He also performs regularly on the shakuhachi (Japanese flute) for cultural and educational events. 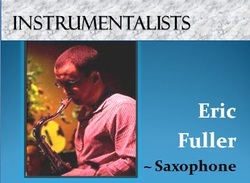 Eric Fuller is an accomplished jazz musician and instructor specializing in jazz improvisation and jazz theory. He teaches students from age eight to adults and all skill levels. His approach to teaching has evolved since he began teaching saxophone at La Jolla Music in 2006, and involves a strong foundation in technique, reading skills, and emphasis on good tone production. Eric began playing saxophone at age ten, but developed a real attraction to jazz at age sixteen. While in high school Eric studied with Joe Marillo, Bob Magnusson, and Casey Persch. From 2002-2006, Eric attended Berklee College of Music in Boston, Massachusetts, pursuing a degree in Professional Music with an emphasis on Jazz Performance. While at Berklee, Eric received instruction from George Garzone, Frank Tiberi, Dave Santoro, Bill Pierce, and Ken Cervenka. Eric was selected to perform in various prestigious ensembles at Berklee, including the Miles Davis, Cedar Walton, and the Charlie Parker ensembles. He currently performs with Tony Muhammad and teaches sax and jazz theory at La Jolla Music. 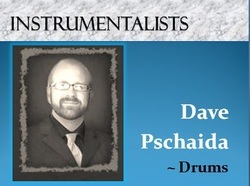 Dave Pschaida​ has over fifteen years of experience as a professional jazz drummer, performing at such venues as Tommy V's of Del Mar, The Prado, Turquoise Café & Bar Europa, The Belly Up Tavern, Dizzy's, Jimmy Loves, Hotel Del Coronado, Cygnet Theatre, The Old Globe Theatre, and San Diego Repertory Theatre. Some of his collaborations include the bands Shift to the Left, Apropos, Firefly Jazz Quartet, and the Applebrown Jazz Ensemble. ​He teaches band through Paul Effman Music in grades 3-8 throughout San Diego County. ​Reno Calice has a strong musical background as a sideman in his early career, as a jazz producer, and in leading his own popular group 'Jazz' in Tucson. After military service, where he was selected for the meritorious 389th U.S. Army Material Command Band and attended the Army School of Music, Reno majored in arranging and composition at Berklee College of Music in Boston. 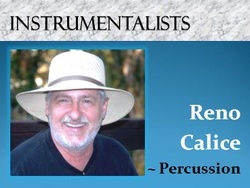 ​He has had a very distinguished career as a perfomer, while also instructing students privately in drums, percussion, theory and harmony. With his music and production talents, he has created numerous videos, including one on the history of jazz and recorded music, one titled after his original composition 'Farcycle, and a concert performance with saxophonist Charles McPherson. "At the heart of Reno Calice there is a hard-hitting, infectuous, soothing, and sophisticated rhythm." 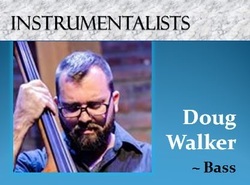 Doug Walker expresses his love of music by passionately participating in many of its genres, including bluegrass, folk, rock, world, and all styles of jazz. For years, he performed in orchestra, big band, and some top-level jazz combos, ultimately earning the M.M. degree in jazz performance in 2007, including studies with Bob Magnusson & Gunnar Biggs. Based in San Diego, Doug continues to teach, compose, perform and record within a circle of exceptional musicians. He endeavors to play an integral role in a wide range of creative projects, spanning the entire spectrum of jazz and beyond. He can be seen performing at San Diego’s local hot-spots, heard on a growing number of records, and felt through his original compositions. Doug Walker is one of the few left-handed acoustic bassists in the country. 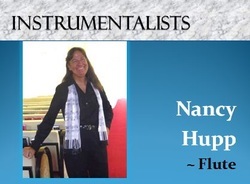 Nancy Hupp A former computer scientist with the Navy research lab, Nancy now concentrates on music, continuing to hone her skills as a musician with many groups. In addition to her 13 years in the Hillcrest Woodwind Ensemble, she performs also with the North Park Winds, and she joins the musicians to play for our choral concerts! ​She also performs as a dancer and musician with the group Roman Holiday… and sometimes, when we’re lucky, she’ll dance in our shows. In 2015 she also appeared in the LJ Playhouse production of the Hunchback of Notre Dame. 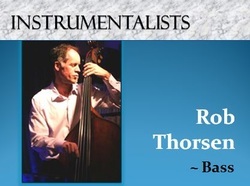 Jazz bassist Rob Thorsen maintains a diverse and busy schedule in Southern California as a performer, educator, clinician and composer. He has found his true voice in the upright bass and performs regularly in San Diego with artists including the Mike Wofford/ Holly Hofmann Quartet, Charles McPherson, Steph Johnson, Gilbert Castellanos, Mundell Lowe and a host of others. He has released four recordings as a leader, the most recent “Lasting Impression” featured an array of jazz talents including pianist Geoffrey Keezer, Josh Nelson, and saxophonist Ben Wendel. In addition to performing with his own quartet he has also created “Jazz an American Art Form” – a hugely successful jazz educational program that has been presented to over 8,000 students this year. “When I began playing upright bass, the fact that I felt the sound as much as heard it had a profound effect on me. I was hooked for life. Steph Johnson - In the wake of the economic crisis of 2008, aspiring musician Steph Johnson made a brave choice: The singer/guitarist chose to abandon her 12-year career in banking and pursue her dreams of making music full-time. In 2011, Johnson had already released two albums and was clearly on the way up in the soul/R&B musical genre with jazzy undertones. In fact, her second CD won an SDMA for "Best Jazz Record" without actually being a jazz document. Later that year, Johnson didn't just switch horses in mid-stream, she switched streams. A chance encounter with double-bassist Rob Thorsen in the green-room at the Ocean Beach Music & Arts Festival led to a drastic change in direction that soon found her leaving behind a fine-tuned band -- with pianist Leo Dombecki and drummer Jesse Charnow -- and a devoted following for the relative insecurities of a life in jazz. 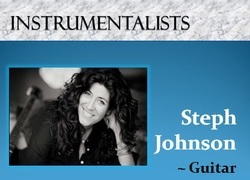 She formed the Steph Johnson Trio with Thorsen and young drum master Fernando Gomez.